Join the discussion on our forums! Come discuss Headhunter's Hatchet over in our dedicated Headhunter's Hatchet discussion topic. I really don't get the love for weapon cards, especially low-damage ones like this. Spend 2 mana, deal 2 damage and take however much you hit face for, repeat one or two times? 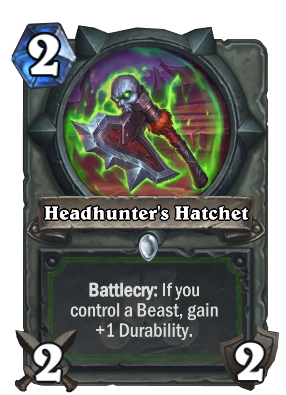 Just doesn't seem worth it, especially since Hunter has no heal. You deal a minimal amount of damage, and in turn, you practically do your opponent's job for them. I could see an argument for 3-damage weapons and above, or weapons with lifesteal or immunity, but 2-damage... you're talking about 1-cost minion levels, here. It's paltry, and liable to do more harm then good. Great card. Probably in every Hunter deck. Great card, I wonder if you cut Eaglehorn Bow or Candleshot for this in Midrange or maybe one of each? Aggro is definitely taking this over Candleshot though. Good. Nothing more nothing less. Sometimes you will just play it as a 2/2 because no beast, but it'S still nice tempo. for your next turn. Will definitely see play in some form, at least as long as Zoolock and Fire Fly are still around. which card are you talking about ? Oh sorry I mean Bloodscalp Stategist. So we are Zul'jin. There is only one question to be asked. You want axe?